Brief, affordable, and engaging, Connections Essentials: Empowering College and Career Success offers the ideal balance of motivational, study, and life skills – in a sleek, streamlined, and fun package. Written by counseling psychologists Paul Gore, Wade Leuwerke, and A.J. 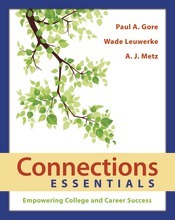 Metz, Connections: Essentials Edition takes a strengths-based approach and spotlights how taking purposeful action helps students set goals and build the skills they need to succeed. This concise, cutting-edge text can be packaged with the powerful ACES self-assessment at a very affordable price.